A kofta is a Middle Eastern preparation for spiced ground meat shaped into a meatball or small meatloaf. Traditionally it is made with ground lamb or beef, but if desired you can use ground chicken to reduce the calories and fat. The addition of mint and cilantro, along with a dash of cinnamon, gives this dish its distinct flavour. To prepare the kofta, you roll the meat mixture into oval shapes, slide them onto skewers (optional) and then grill or bake them. Kofta goes well with homemade tahini sauce and diced vegetables. I love to serve it with warmed naan bread or a soft bun. 1. Preheat the oven to 400°F. Soak eight 6-inch wooden skewers in water or set aside 8 metal skewers (if using). Line a baking sheet with foil and lightly spray with vegetable oil. 2. In a large bowl, combine the ground beef, onion, garlic, cinnamon, eggs, breadcrumbs, mint, cilantro, and salt and pepper (use your hands to make sure all of the ingredients are evenly distributed). 3. Divide the mixture into 8 equal portions and form into oval shapes. If using skewers, slide 1 portion lengthwise onto each skewer. 4. Heat a grill pan over medium-high heat. Working in batches, sear the koftas on each side for 2 minutes, until browned all over. 5. Transfer the browned kofta to a baking sheet. Bake in the preheated oven for 10 minutes or just until they reach an internal temperature of 160°F. 7. Make the garnish: In a bowl, combine the tomatoes and cucumber. 8. 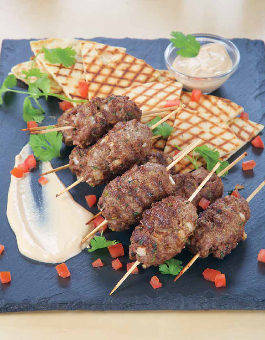 Serve koftas with the tahini sauce and garnish. If using naan bread, grill for 2 minutes per side, until lightly toasted, then cut into triangles and serve alongside koftas.